A sense of familiarity settles over you as you come in and walk around James Schriber’s house. Many of the furnishings look like what you might have grown up with or seen in some up-to-date, fashionable house when you were a kid. 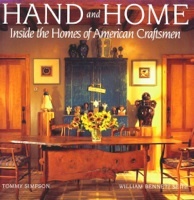 James is a woodworker in love with the fifties, forties, and earlier decades of twentieth century design. Who can say why certain visual elements speak to us— produce a feeling of “that’s me”—while others leave us unmoved? Maybe for James it has something to do with the idea of your past living in the house with you.A great deal in James’s home shows affection for the past. 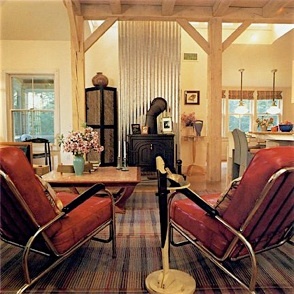 It is as if the angles of classic New England design, or of the flat Ohio countryside where he grew up, have given way, melted into the softer curves of domestic furnishings that began appearing in the late twenties and continued in some form through the fifties. About the only right angles in James’s house are on bookshelves, storage shelves and cabinets, and a large standing screen he once made for a special exhibition. He is particularly attracted to furniture and decorative objects that have a strong design element. Of course, much of what he collects reflects his own work – pieces with rounded edges reminiscent of Art Deco and Moderne styles. Whether it is made of exotic woods and inlays, is highly polished, or displays simple, subtle curves and is covered in milk paint, James’s furniture all has a common thread. He also likes mid-century modern designs that became American classics, such as the work of Charles Eames and the Scandinavian designer Hans Wegner. He has chairs he just “came across” by each of them. As with many craftsmen’s homes, James’s decor is a combination of his own work, what he has discovered at flea markets and country shops (or, in one case, in an abandoned barn), and work by other designers and craftsmen. James’s father had a sheet-metal shop. James grew up in that shop, and he liked the idea that his father, in creating his own shop, had captured the pleasures of the past. He did not know what he wanted to do when he went to a small college in Vermont, but the educational experience was a catalyst that ultimately returned him to his origins. One of his teachers was a practicing architect who gave the students opportunities for hands-on experience. James realized white taking his class that it was not building houses, as such, but working with wood that called to him: He had a need to craft things. Woodworking “felt right” because he could design and build and express himself artistically in one all-encompassing activity. His approach to his work today has both an artistic side and a business side. It is balanced among commissions, making cabinets and storage pieces, and making furniture for gallery and museum exhibitions. In this last category he displays a more eclectic interest in historic furniture than is apparent in what he has chosen for his own home. James employs from one to three people in his business, an approach that represents the smaller end of the spectrum for studio furniture makers. Most studio furniture people teach. Only a few, like James, maintain a full-time business in addition to their gallery work. After further schooling in his craft at Boston University, James ended up in Connecticut, where he set up his own business and lived in town in a loft he converted. After some years he and Karen Ross, with whom he shares his life and his home, decided they were ready for their own house. James grew up in Dayton, surrounded by the cornfields of southwest Ohio, and he loved the white farmhouses with their green shingled roofs. He wanted a similar look for his own home. He hired his friend and former partner, architect McKee Patterson. James and Mac had owned and run a construction firm, called Full House, that provided comprehensive services, from putting up the house to planning and installing the cabinetry. For his own house, James gave input at every step. He knew he wanted an archetypal “house” with a big front porch. The result of their collaboration was a white clapboard house sitting in a garden, with tall old trees, a lawn, and about three acres of woods. 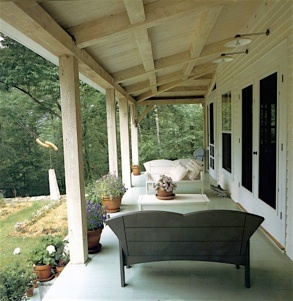 The post-and-beam porch runs around on three sides. The heart of the house is the open living room and kitchen area. In the high-ceilinged room is a hemlock canopy of timber-frame construction. 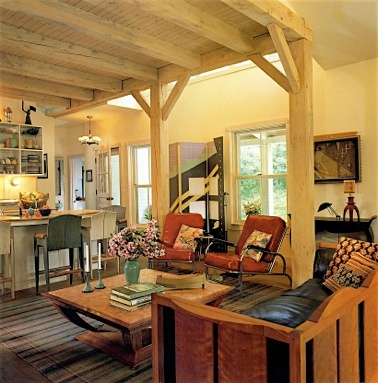 Diagonal wood brackets run from either side of the posts to the horizontal beam, forming the kind of Y-shaped support associated with country porches. There were several reasons for installing an unusual canopy that forms a kind of roof under the ceiling. James wanted texture in a room that had mostly smoothness and not much detailing, and, as he is a wood person, wood seemed a good way to get it. The canopy echoes the design of the porch and unifies the open kitchen and living room beneath it. it also has a psychological function – it is an area both set apart and protected. With the openness all around, sitting in the room is like sitting on a porch, like being on vacation. It’s not what you would usually associate with New England – not indoors. The builders did everything up to the Sheetrock, and then James took over. He did all the interior work, including the Victorian-style trim around the windows, all the built-in cabinetry, and all the finishing touches. James and Karen found and salvaged many reusable items and stored them away until needed – plumbing, electrical parts, light fixtures. lames knows the building trade, so he knew what he had to collect. 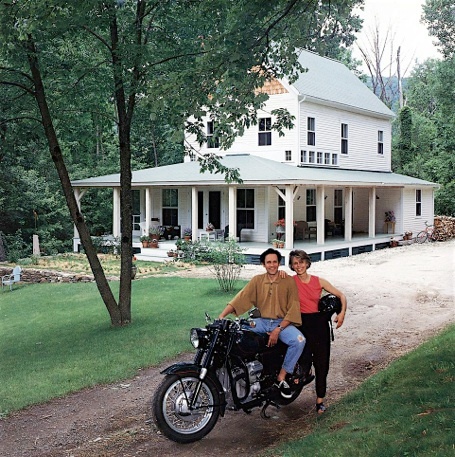 The house was started in 1987 and took nine months to complete. Eventually, James and Karen want to put in a barn for a garage, and they might build a shop too – although James has said that he would never want a shop at home. He works at a building in town, near Karen’s hairdressing salon. James and Karen keep the ground floor of the house for themselves; they found they enjoyed a one-floor, open-plan living space when they had the loft in town. The second floor is for Karen’s daughter Heidi, who recently graduated from college. On the top floor there is a guest room. The living room and kitchen take up most of the first floor. On the west side of the house there is a screened dining porch -a continuation of the wraparound porch. Next to it is the indoor dining room, just off the kitchen. 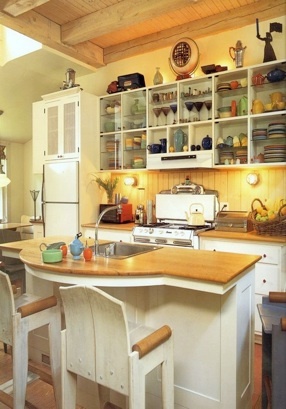 On the other side of the kitchen is a washing-up pantry. They decided that if they were going to have an open kitchen, they would want someplace where the business end of entertaining could happen, the dirty dishes kept out of sight. Their bedroom and bath are also on the first floor, at the back of the house, facing north — there is a little balcony off the bedroom, looking out at the woods. For James his house is an icon, as economical in its lines as a child’s drawing — a simple, visually accessible, nostalgic form that can be taken in at a glance. And for him, building and furnishing the house was simply a large-scale version of making furniture.